I love to read, especially using a Kindle. Like many of you, a part of me misses “real” books. I miss going to the bookstore and judging a book by the cover. I miss trading in my used books to Dave’s Olde Bookshop and getting store credit to buy more used books. I miss having friends hand me books at the gym that they loved. Book discovery was easier for me back then. I miss the library. There’s a lot I don’t miss about real books. I don’t miss those paperback books that had the binding too tight so you had a hard time reading the inner edge of a sentence and you swear you’re ONLY going to buy Penguin books from now on because they have easier bindings. I don’t miss reading the beginning of a hard-cover book when I’d lay on my side and the whole weight of the book was on top (or the end of the book when it flipped the other way). I don’t miss the weight of carrying 5 books on vacation. I don’t miss finishing a book and realizing that I don’t have a new one with me. I don’t miss reading books where the text was too small. I don’t miss having to read with the lights on, keeping Steve awake. For me, the benefits of electronic books win out. I started reading electronic books on my iPad a few years ago and loved it, but then got my first Kindle and never went back. 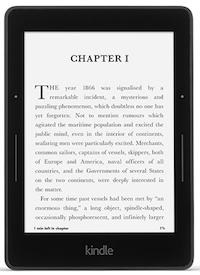 Two things pushed me to the Kindle – the lightness of the device and the complete lack of distraction it offered. When I use my iPad to read, I simply can’t stop myself from checking Twitter. With the Kindle, it does one thing and does it well. I didn’t jump on the Kindle bandwagon early; my first was the second version of the Kindle Touch, which I think was the 5th model of the Kindle. I upgraded to the Kindle Paperwhite after that, and now I’m sporting the Kindle Voyage. The jump from the Kindle Touch to the Paperwhite was huge. The brightness of the backlight made it so much easier to read, and it was a lot faster. Steve and I handed down our Kindles to our kids so we felt justified getting the newer models. I have to say though, if you have a Kindle Paperwhite, the jump to the Voyage is not nearly as big. It’s pretty, and it feels nice, but people described the look of the text as being AMAZING. I sure wouldn’t say that. Steve and I put the Voyage side by side with the Paperwhite and we could barely tell the difference. The Voyage has a spot on the bezel where you can squeeze to turn the page, but it’s a lot harder than just swiping on the screen, even if you adjust the settings to be the easiest to press. We still justified the purchases though by handing down our Paperwhites to the kids. We did it for the children, you know. Another consideration in choosing a Kindle is cellular or not, and ads or not. My first Kindle had cellular capability but I have to admit that I never once had a book-related emergency that couldn’t wait for Wifi. I do hate to be without a book but even I can look that far ahead. I also choose the Kindles with ads. The way they’re described you imagine reading along and suddenly when you turn a page there’s an ad, but that’s not how it works at all. There are ONLY ads on the static page when you turn the Kindle off and they’ve recently they’ve included a small ad when viewing your list of books. Most of the time they’re advertising books anyway so they’re even good ads. There’s a lot to love about reading on a Kindle. I love being able to make the text small or large depending on my mood and glasses of the day. I love having the backlight for night time reading. The Voyage has a setting where you can have the light slowly dim after you shut off your room lights. That really makes me happy. I love being able to flip the page with a gentle flick of my finger. I love sharing an Amazon account with Steve and my kids so we can share books. I love how I can touch on a word and get a definition. I love it when I think “hey, that’s not a real word!” and the Kindle’s dictionary proves me right! I love being able to buy books on my Mac and having them instantly sent to my Kindle. I love how if I’m out and about and get stuck somewhere, I can open my book on my iPad or iPhone and pick up right where I left off on my Kindle. One time Steve forgot his Kindle at Lindsay’s house, so I just let him use my iPad to read until we had a chance to get it back. it’s not all happy happy joy joy though. I find the Kindle menus really confusing and slow to navigate. In my ideal world, I would be able to categorize my books, maybe even having tags or other metadata. I can picture read vs. not read, who told me to read a book, maybe a tag for “read right away” and “read when you’re desperate”. Instead I have On Device, and On Cloud. To be able to tell which ones I’ve read, I have to look at each book and see if the little dots go all the way across the bottom. They do allow you to create Categories, which are really folders, but creating them and moving books into them is tedious and confusing, and each book can only be in one folder. Thanks to Michelle York in the comments below on correcting me! If a book is in the cloud, it can’t be in a folder at all, only the books on the device can be in folders. Unless I’m wrong, which is altogether possible and I’d love to be corrected! I have 92 books in my library and even via the web, I can only view them by when they were purchased, or alphabetical order. That’s it. Especially with sharing of an account, this thing is a big mess and I can’t figure out how to organize it, and over time it will only get worse. I feel like a hoarder surrounded by piles of books with no order to them. I really really miss the ability to flip back through a book to try to remind myself of something I’ve read. For example, I’m reading a book right now that has a lot of very colorful and interesting characters who are related to each other. But I can’t remember if Margie is Veronika’s mother or her grandmother? If I were reading this as a paper book, I could easily stick my finger to hold my place, and flip the pages till I found where they explained that relationship. I know, I could place a bookmark on the page, and then tap tap tap back, or even use the “go to” page to try and move by a chunk of pages, but neither method is efficient for skimming through to find something. I really miss having people hand me books they love. I know there are book clubs online but I haven’t done a good job of joining any. I’m in GoodReads, but I haven’t invested the time to put in the books I liked (and didn’t like) so that I can find my tribe. I really do plan on doing that some day. I should mention that people still hand me books, but I actually can’t stand reading real books any more. I miss the IDEA of real books, but I don’t actually miss real books. I felt badly that my brother bought a brand new, hard-backed book and paid to mail it to me. I bought it on Amazon and read it on my Kindle and never told him! I’ll tell you the worst part of reading electronically though. Books end early. The Kindle gives you a couple of ways to tell you how far into the book you are. You can see a page count, but it changes depending on how big your text is, which makes sense. You can see what percentage you are through the book which I find much more useful. But sometimes the book ends well before 100%. Sometimes it’s because of an index, sometimes it’s a preview of another book. I know that happens in paper books, but it seems to happen way more in electronic books than it does in paper books. Maybe because those bits are cheap so including other glop is easy? The worst case of this happened to Steve, he was only 50% through a really good book when it suddenly ended. The second half was a totally different book by an author he had never heard of. Can you imagine how annoying that was? I read the book “What If?” by Randall Munroe, the comic artist who does the xkcd cartoons. It was a great book but it was horrible to read on the Kindle. Munroe includes cartoon illustrations in his books but the Kindle operating system simply can’t handle them. I’d try to turn the page and it would do nothing for a very long time. I actually thought that my Kindle was failing because the experience was so bad. In addition, the drawings were so tiny that I couldn’t even read the captions. I could make the text of the book an inch tall but the drawings stayed the same size. So I didn’t get the jokes, and the reading experience was dreadful. I’d avoid buying any books with graphics (even stick figure cartoons) to read on the Kindle. Back to things I like about electronic books. Years ago I posted about how I was angry with the publishers that the price of e-books wasn’t significantly lower than the price of paper books. With paper books you have so much waste they have to be more expensive. The publisher has to guess how many books to print, and all the ones that don’t sell still have to be shipped and later disposed of or moved to the bargain bin. You have to cut down trees for crying out loud! You have to print and box and ship and put on shelves. Space on shelves costs money too! I know as well as the next guy that storing digital bits isn’t free, but the cost to keep a book ready to be downloaded by me is a heck of a lot less than having it sit on the shelves of the bookstore. The good news is that e-books have gotten a lot cheaper. I rarely pay more than $6 for a book these days, and if you’re clever at all it’s really easy to find books for $2. Heck there’s a ton of classics for free because they’re in the public domain now. I finally read “Wind in the Willows” for the first time! I’m reading more than ever before because of electronic books, but I think overall I’m spending more because I buy everything. Stay tuned for Part 2 of my reading saga – all about the library experience with electronic books. Maybe the Kindle Voyage is different, but on my Kindle Paperwhite I have books in multiple “collections”. My collections are my categories. I can have a book in mystery/suspense, romance, and unread. When I finish the book and check the unread category and check the “read” category. You can create as many categories as you want any name them anything you desire. You rock, Michelle! I didn’t even TRY to put the books in more than one category. It totally works. This blogging before podcasting thing is really paying off. Now I only sound like an idiot here, instead of here AND in the show! Will add an in-line correction to the notes crediting you. Re – Randall’s What If. I have that book, and the iPad Kindle app handles the images much better. You just double tap the illustration, and up it pops. You can then pinch and zoom. I like my paperwhite for casual reading. Reference books, they go on the iPad. Also, for computer reference books, check out o’reilly books. DRM free. Multiple formats. Can be delivered straight to your dropbox. Or Kindle.